02:30 and the alarm has just gone off. I blow my nose again as I have been doing throughout the night and try to clear my head of this persistent cold. I wonder if running today is really such a good idea, didn’t the race notes say “Please do not run unless you are totally physically fit on the day as this is a very demanding race” ? I ponder this for a while and debate with myself the definition of ‘totally physically fit’. I conclude as most long distance runners would that this warning is meant for someone else, and anyway my cold will surely pass and I’ll be fine, sort of. I slip an extra pack of tissues into my bag just in case. 03:30 and I am on the road for a 132 mile drive to Harlech. On the long journey it occurs to me that today’s run is almost a third as long as the drive to get there, and I wish that thought had not entered my head. The step up from a marathon is a big one so I am pleased that a few weeks ago I ran 37.2 miles at The Trailblaster although that was mostly flat with some undulation. Today’s 42 miles will be somewhat more challenging. I arrive early at Harlech railway station to catch the 07:17 train to Aberdovey, and have time to review what I am going to wear and the kit I will carry. I have in the back of the car some options. I had designated this race as the one at which I would wear my 100 marathon Club shirt for the very first time, and yet now when the time comes to pull on the shirt it feels so much more comforting to slip on the familiar green machine shirt, which I do instead. Next is shoe selection. The race is multi terrain and the race notes had said that either trail or road shoes would be suitable. I opt for the comfort of my road shoes. I then pick up my pre packed backpack of ‘compulsory’ kit (rucksack with bladder containing minimum 1ltr water; emergency food; fully charged mobile; waterproof jacket; waterproof trousers; additional warm top; whistle; maps; compass; first aid kit and a plastic cup as the check points are cup-less). Additionally I have a bottle of electrolyte and a change of socks, and I am again concerned at the ridiculous weight I am to carry. I wonder if I could lose a few things and if there will be a kit check. I don’t want to be disqualified so carry the pack as it is. The race starts at the end of a sandy track leading across soft sand to Aberdovey beach (can I already feel sand in my shoes ? ), we turn right thankfully onto damp sand and run North across endless sand towards….well more sand, and as far as the eye can see. My running is already sluggish, my nose is streaming, my gait is laboured, sand is not my favourite surface, I am already thinking what am I doing here ? I am quickly amongst the back runners. My phone rings. I scrabble amongst the mass of kit to retrieve my phone from it’s protective waterproof bag, by which time it has stopped ringing. I have a missed call from my wife Gill. I decide I’ll call her back later, and put the phone away. The phone rings again and this time I retrieve it in time and assure Gill that I’m fine and that my cold is not a problem and I try not to sniff on the phone as I reach for another tissue. Gill accepts that I’m ok and I agree to call her with an update in due course. I notice that during all this the remaining six people that were behind me are now in front of me. 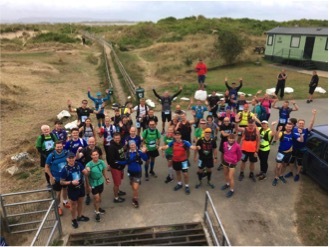 I’m feeling miserable, and again think “what am I doing here ?”….. Well, it all started late in 2017 when Anne Lowe announced that she wanted to run a 40 miler in 2018 to celebrate her 40th birthday and did anyone know of any suitable runs. Most of the possible candidates were too early in the year and too close to Anne’s planned Spring Marathon. 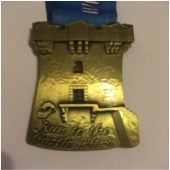 I knew about the Run to the Castle race as I have run with “How Hard Can It Be” the events company staging it quite a few times before. Anne said that sounded like the ideal one, so I discussed the 40 miler with Denzil the race organiser after another race over a drink in the pub and said to him that it sounded hilly. “Nah” he said “it’s not as bad as you’d imagine, although actually it is a bit over 42 miles rather than 40, but you’ll be fine, you’d love it”. And so our plan to celebrate Anne’s 40th year with a North Wales run was hatched. In fact it became a cornerstone to my running plan for 2018. Then Anne dropped the bombshell that she didn’t think she was up to it and would not be doing it after all. “Oh well” I said “I’ll just have to celebrate your 40th on my own”. And so here I am – stupid bugger. Although the race has only just started I am struggling and automatically slip into my “marathon tired mode” of running. I clench both fists and as I run count 20 paces and then extend my index finger on my right hand. I count another 20 paces and extend my middle finger, when all fingers and thumb are extended I have run 100 paces, 2 hands equals 200 paces and so on. I reward myself with a 50 pace walk after 500 paces run and repeat the cycle. The constant counting shuts out negative thoughts, and although I am not gaining on the people in front, they are no longer pulling away from me. We eventually come off of the beach on to a promenade and the same strategy now closes the gap, I pass three people running together and then two more and then a solo and I am feeling so much better now I am no longer last, and now that there is something properly firm for my feet to push against. Just after Tywyn we turn inland across fields and grass tracks around a wide stretch of water. Is it the surface, or the fact that I am no longer the back marker that makes me feel so much better. In fact, can it be that I am actually enjoying this as I look around and am struck by the stunning beauty of the surroundings. 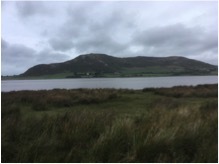 I continue alongside a river and before I know it I am on a road and there in a lay-by near Bryn Cruig is Check point 1 at 9 miles. The last few miles have been so comfortable and enjoyable that I comment that I am surprised to be there so soon. Having topped up my bottle of electrolyte I head on and am soon regretting my optimism. There now begins the first of the real climbs. The next seven miles to checkpoint 2 are a mixture of long hills going up and shorter steep ones coming down on a variety of terrains: fields, tracks, roads, but fortunately not sand. After crossing several gated farm fields and crossing a number of stiles I come to a farm track and turn right down to a road junction. The route has been reasonably well marked and so as I look around for a painted blue arrow on the ground or a red sign attached to a post I start to wonder if I should have turned left at the last way point. It’s time to get the maps and compass out. I am not entirely sure where on the map I am so I pull out my phone to find my location on Google maps….. No signal. I look up the track behind me, but there are no runners visible. Leaving my kit and maps at the junction I wander out back up the path I have just come down, then I turn back again and walk along the road looking for something to identify where I am. There is a road sign with a village name on it. I go back to my kit to look for the village on my map and notice I have rested my rucksack against a farm’s name sign. Both the village and farm are marked on my map and I decide that I am in the right place and just need to cross this staggered junction. As I get to the other side there on the ground is the blue arrow I have been looking for for the last 10 minutes. Still I am now somewhat better rested, and set off again with renewed vigour. Across the junction the path turns to the left and then heads upwards. My renewed vigour had lasted for about 90 seconds. The next few miles are a hard slog, but I keep telling myself it’s good training for Snowdonia. Checkpoint 2 is at the back of a pub in Llyngwril. I go Into the comfort of the pub to the toilet and stop on the way out as I realise that this is the 16 mile point and I therefore still have a full marathon ahead of me. I briefly toy with the idea of ordering a pint, and pulling up a comfy chair, but instead push on. The next few miles are brutal. I continue to climb on frequently changing surfaces which now includes woodland paths, but fortunately no sand. The scenery is no longer so dramatic as the mist and rain has descended. I am now getting quite wet and probably ought to consider putting my waterproofs on but I really don’t want to wear another layer and don’t want to take the rucksack off and on again. On the wet downhill grassy sections my ankles keep turning over and I am getting worried about twisting an ankle and my feet are now soaking wet. I wish I had chosen to wear my trail shoes. As I reach the sea again I am a bit concerned that we are heading for more sand but the route turns along the promenade at Fairbourne. After turning inland again Barmouth Bridge comes into sight, but it seems to take forever before I get there. It feels special running across Barmouth Bridge, I have seen the bridge on numerous occasions from both land and sea but have never crossed it before. After negotiating the traffic just after coming off Barmouth Bridge I turn left and head towards Barmouth promenade and checkpoint 3. A couple of hundred yards before the checkpoint and the Marathon finish at 26.5 miles I see the legend that is John Kew who I have run with a number of times before (he has over a thousand marathons under his belt). 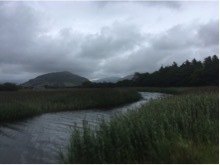 John had finished his marathon and was heading back towards Barmouth railway station. John calls out to me and is going to wait for me to finish my marathon and walk to the train with me. I explain that I am not stopping here but running the Ultra. He gives me a puzzled look and declares in his strong West Country accent “You’re not going to make it are you ?” I initially think I must look so knackered he is commenting about how I am likely to collapse, but he goes on “it’s taken you over 7 hours to get this far and you’ve 16 miles still to go and less than 4 hours left to get there”. I ponder this for a moment and then realise somehow John has dropped an hour and there is a bit less than 5 hours to the cut off. I point this out to John, but he still asks me if I really think I can do it ?. I’m a bit put out by his doubting me and armed with renewed self doubts I say my goodbye to John and run to the checkpoint. I refuel with biscuits nuts coke and a cereal bar and top up my electrolyte bottle and I take a little longer rest than at the earlier checkpoints. Just as I am about to set off again three runners arrive at the checkpoint. This has been a tough lonely run and I decide that I could do with some company for a while so I wait for them to refuel. One of them is finishing here at the marathon but the other 2 James and Elly set off again with me. We run and chat and I am more relaxed now, and my plan is to let just a couple of miles pass by and then up my pace a bit and push on. But now I start to feel that oh so familiar pre-cramp sensation in my left thigh that has been so common over the years. Experience tells me that I need to walk for a while and take some salt tablets. Although I urge the other runners to push on and I’ll catch them up they walk with me until the pre-cramp sensation has passed and I can run again. My problem now is how can I up my pace and leave them when they have been so considerate in staying with me ?. From here on we either all make the cut off or we all don’t. The next few miles are again a mixture of road and farm fields with an increasing number of stiles to climb over, but I am relaxed as we chat about things nothing to do with running. We reach checkpoint 4 in a car park at 32 miles. After a quick refuel we head off a short distance on to…… Oh god no, it’s another beach. James and Elly are waxing lyrical about the joys of running on sand. I have recurring nightmares about the Dunes half marathon in Fuerteventura when I burst blisters on both feet. Sand in burst blisters is no fun, and although there is little danger of a repeat of that here, sand remains my least favourite surface. After a couple of miles of beach running we reach Shell Island and leave the sand behind passing through campsites back onto roads then more farm fields and more stiles. 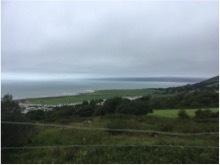 At about 40 miles at Llanfair we reach a cliff top with deep steps down to yes you guessed it another beach. At the bottom there are boulders to negotiate before getting onto the sand and the last 2 miles to the finish. As we turn off of the beach we cross fine dry sand that the wind has blown into a mini dune. It’s as if it’s been waiting for me and finally with a few hundred metres to go I quite definitely have lots of sand in my shoes. And then there in front of me is the finish with the Castle just beyond. As often happens at the end of a long distance run I find I have energy to finish with, that I could not find earlier. Where does that come from ? Denzil and his small team of helpers give me a warm welcome as I cross the finish line 10 minutes inside the cut off time and place my Castle medal around my neck. 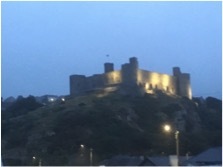 As I raise my phone to take a photo of the castle before the light goes altogether there is a sudden burst of light, I lower my phone thinking that the flash has gone off unexpectedly and then realise that the castle floodlights have come on at that very moment. The magic of the moment makes me smile. This has been a special day. As I walk back to my car to empty the sand from my shoes and start the long journey home I reflect on how much Anne would have loved to complete this run. It’s a run of love and hate in equal measures but the feeling of achievement is immense. Maybe next year Anne ? I’ll certainly be back, but hopefully without the cold, with less kit and wearing trail shoes. So Happy 40th year on this planet Anne. This run was most definitely dedicated to you. So what next ? Hmm, do I know anyone coming up to their 50th who might fancy a 50 mile run ? This is my experience of the 2017 Greater Manchester Marathon. This was my first marathon and I was following the BUPA marathon plan. I really enjoyed the structure and focus the plan gave me and I found the way the miles built up more achievable. It also encouraged me to try other forms of exercise such as spinning and strength work which was totally new to me but I felt really helped get me marathon ready. I was running the marathon alongside my pal Laura (or Lozzer as she now affectionally called) Higson, it was also her first marathon. We hadn’t covered many miles together due to colliding schedules but we had kept each other updated on progress over the weeks. We picked Laura up on the way to town at 8am where we were getting the tram, to say that we were delirious was an understatement, like two giggly toddlers exposed to too much sugar we constantly erupted into laughter for most of the early morning. The slightest thing was enough to start us off, which was a blessing as it distracted us from what we were about to undertake. We were supposed to meeting up with Steve (The Wizard as he is now affectionally called) Bassam, but he was having car parking issues so we made our way to the start, this was unnerving as we were hoping to have him with us to keep us from losing our minds. Just then, like a vision in the distance we saw The Wizard strolling calm as anything towards us – our marathon gang complete!! I was expecting pens of runners at the start but it was simply a melee of people all setting off so that was a bit of a let-down as we were expecting a gun going off but we set off steady, got our rhythm right and off we went. We went out a bit too strong for Steve who wanted to knock his heart rate down so at about mile 6 it was just Lozzer and I. We’d previously agreed that we would take it steady around 11 minute miles pace but feeling strong we ate up the first half of the race in 2 hours 19 minutes, ahead of our schedule. The crowds on the course we simply amazing. I had never experienced such an atmosphere, at one point we ran past a stage with music pumping out the Jackson Fives’ Blame it on the Boogie and I started dancing to the actions, on a bloody marathon course, what was I thinking!?! We had been running alongside the 4:45 pacing team for a while but felt that their pace was annoyingly slow, with hindsight we maybe should have stayed with them, but to be fair I hadn’t anticipated what came next for me…. I had a niggling feeling that there was a blister developing on the pad of my foot and as we ran through Timperley I spotted a podiatrist that was open, I decided to pop in on the return way past and see if they could stick a plaster on it, otherwise I was going to struggle to complete the rest of the distance, by the time we hit that point again it was mile 16 and I was really starting to feel the blister. I hadn’t really mentioned anything to Laura about this until about 14 miles but when we were in sight of the shop I announced that I was going to have to nip in for treatment and that she should crack on. I bazzed into the shop and begged the lady to fix me up, which she very graciously did but it wasted valuable minutes as I had to take my trainer and sock off, get plastered up and get on the road again, by this point Laura was a dot on the horizon, I found some ungodly strength to get me up the hill and when she was in sight I started shouting “LOZZZZZZZZZER!!! !”, amazingly I caught her back up. I admit that took some doing and it sapped me of energy and unnerved me in the process. Mile 19 onwards took us out into Flixton and into the countryside, that’s where I think the wall kicked in. I struggled mentally to concentrate, I was tired and bored and just wanted it to be over. I plodded on, stopping occasionally to walk a bit then running on. At this point Laura and I had pretty much stopped running side by side and were just focusing on putting one foot in front of the other. We both found that when we slowed to a walk it actually made us feel queasy so although it was getting unpleasant and painful it was better to run but it hurt our mile splits. I’d hoped that getting back onto the streets with spectators would raise our spirits but it really was in the mind zone now, all I could think about was if I was going to be able to do this and it consumed all my thoughts. My body was really starting to break down, I felt woozy and spaced, irritated and irrationally emotional, I realised that I was really dehydrated so I made sure that I took some water on. The Royton Road Runners water station at mile 23 was a sight to behold and I took 2 bottles of water and a gel. I reasoned with myself that I had 3 short miles left, one Parkrun, the equivalent of running from my house, through Alky and back home, I COULD DO THIS!!! I mentally made the decision to smash the rest of this marathon in the face and somehow, I just started to run. I began to plod rhythmically towards the finish, I think it was about here that I just started to pull away from Laura. I could see Old Trafford in the distance, my spirit began to rise and I refocused and pushed on. The spectators on the course were fantastic, literally willing us to make it to the end. I could see the finish line, it was 800m away… 2 laps of the track but as hard I as I tried it literally felt like it was moving further and further away. I then heard my support team shouting my name, I looked over and saw my lovely family and it gave me the boost I needed. I powered down the to the finish, my legs and hips screaming but I was finally confident that I was going to make it. I looked at my watched and it was 4:58, I dared to dream that I might get in under 5 hours and pushed a bit more but it wasn’t my day to break sub 5 as I got over in 5 hours and 22 seconds. I can’t be disappointed with this time as I’d initially said that I was aiming for 5 and a half hours so to come in where I did was a miracle. So, I am now a proper marathoner, it’s something 4 years ago I never dreamed I would accomplish so I am amazingly proud of myself, not only for completing it but for committing to months of training beforehand. Now the question is do I sign up for it again next year to break the 5 hours’ time….. 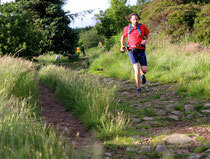 The 39 mountain trail runs follow a classic section of The Pennine Way, in the Cumbrian/Durham Pennines. The route runs from Bowlees Visitor Centre in Middleton-in-Teesdale up glorious riverside trails, past Cauldron’s Snout. From here the route goes via High Cup Nick to Dufton, and then over Crossfell to Alston. There was then a very scenic coach ride to the start at Bowness and whilst on the coach I realise it was a really low key event with just 46 other runners planning to tackle the highest peaks of the Pennine Way. I had a really strong start covering the first 5 or 6 miles with the fastest group, although the single leader was already heading off - never to be caught. The path became quite tricky along the river Tees and I was having to scramble over rocks using hands and feet. My problems soon begun as I hit a hard rock with the sole of my left foot and clearly bruised it through the incredibly thin sole of my Vivobarefoot shoes. The path then turned into an man-made rocky track that had obviously been built for some kind of 4 wheel drive vehicle. I now had pain every time I placed my left foot on the ground and I had only covered 10 miles and just reached the pinnacle of the first half of the race. The next 8 miles were mostly down hill to Dufton. I was in quite a lot of pain arriving at this checkpoint and considered stopping at this point, but I figure I could walk the next section without losing too much time at it was all uphill. The climb to Knock Old Man was long and exhausting, and I was having to consider where I was placing my foot every step to try to minimise the pain. At this point I was being continually overtaken, but I was just focused on ignoring the pain and getting to the top. The next stretch across to Cross Fell was amazing the view was fantastic but unfortunately I was having to watch the ground far too closely to fully appreciate it. 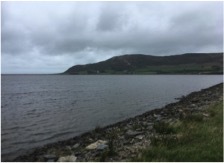 When I reached Cross Fell I was convinced the race would get easier, but there was another extremely rocky and therefore painful path that undulated for a great distance before it finally descended to Garrigil. I was still having to walk, a path that should have been very runnable, but fortunately, a fellow runner caught up with me, we began talking and I managed to keep pace with her for the next few miles. It was now a very fast walk interspersed with some light footed running until I reached the final checkpoint at Garrigil. At the checkpoint I had a coffee and the caffeine burst enabled me to run the next two miles at a good pace as the path was now much smoother, and I was confident I could run without further damaging my foot. I slowed a bit on the last two miles and finally finished with a time at Alston of 8 hours 27 minutes. The food and general atmosphere after the race were fantastic (there was even free beer!) A few runner stayed overnight and we had a leisurely breakfast the next morning before going our separate ways. Malcolm from Cleveland (originally from Stretford) would like to thank those members of your club who assisted him during Saturday's Welsh Castles Relay. Having been left by my team at the end of leg 4 in a mobile free reception zone I flagged down your van and bummed a lift to Stage 8 on your van and transfer car. Thanks to Brian and Alison in the car and particularly to Julie who managed to get through stage 8 ( which is much harder than I let on!). All the best for the future to all your club members. To all the members who ran in the Calderdale Way Relay a big thank you from the Committee for the work that you put in in the weeks leading up to the event. This work resulted in a great performance from you all on the day which will be reflected in the results when they are available. The mixed team format appears to work well and is something to be considered for the future. Can I say thank you also to all who helped with the recce of the various legs and a big thank you to Peter for ensuring we had transport at the end of the route. What a team! It's an amazing event and a privilege to be part of this club experience. 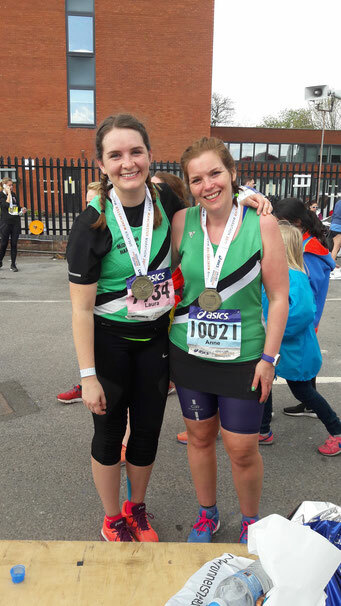 Manchester Marathon: .... Janice Pugh writes ......!